Ali MacGraw in an Ossie Clark-designed ensemble, 1969. 1957-61, and Royal College of Art, 1961-65. Family: Married Celia Birtwell, 1969 (divorced); children: Albert. Career: Freelance designer, selling to Quorum, London, and Henri Bendel, New York, 1964-74, and to Mendes, French ready-to-wear firm; designer, Quorum, 1965-74; designer, Radley, 1968 and 1983; business closed, 1981; business reorganized, 1983; signed contract with Evocative boutique for made-to-measure clothes, 1987; murdered, 1996; diaries published, 1999; homage by Decades retro shop, 2000. Exhibitions: Warrington, Cheshire, gallery and museum showing, 1999. Awards: Bath Museum of Costume Dress of the Year award, 1969. Died: 6 August 1996, of stab wounds. Design by Ossie Clark, 1970. Mulvagh, Jane, Vivienne Westwood: An Unfashionable Life, NewYork, 1999. Rous, Lary Henrietta, ed., The Ossie Clark Diaries, London, 1999. Peters, Pauline, "Ossie and Alice in Wonderland," in the Sunday Times Magazine (London), 11 January 1970. Roberts, Michael, "Michael Roberts Talks to Ossie Clark," in the Sunday Times (London), 16 November 1975. "Ossie Clark Designs," in the Times (London), 27 January 1976. "Ossie Clark Special," in Ritz (London), No. 5, 1977. "Ossie Clark Goes Out of Business," in the Times (London), 5February 1981. "Peace in Our Time: Summer of Love Revisited," in Elle (London),June 1987. Howell, Georgina, "The Dressmaker," in the Sunday Times Magazine (London), 12 July 1987. Flanagan, Kathryn Flett, "Darling I've Seen It All Before," in the Observer, 15 August 1996. Thomas, Robert, "Ossie Clark…British Designer Defined Mood,"[obituary] in the New York Times, 12 August 1996. Bowles, Hamish, "Ossie Clark: 1942-1996," in Vogue, November 1996. Bachrach, Judy, "Hooked on Glamor," in Vanity Fair, December 1996. Leadbeater, Charles, "And This Was 1996," in the New Statesman, 20December 1996. Rouse, Antony, "The Other Clark Diaries," the Spectator, 28 November 1998. Young, Elizabeth, "Vivienne Westwood: An Unfashionable Life," in the New Statesman, 1 January 1999. ——, "The Ossie Clark Diaries," in the New Statesman, 1 January 1999. Frankel, Susannah, "Warrington Celebrates Ossie Clark, the Designer Who Dressed the Sixties," in the Independent (London), 30 October 1999. Arbetter, Lisa, "News," in In Style, 1 February 2000. Thomas, Dana, "Ossified," in the New York Times Magazine, 20February 2000. Lycett, Andrew, "Something Sensational," in the New Statesman, 11December 2000. "Ossie Clark," [profile], available online at Decades Inc., www.decadesinc.com , 17 July 2001. "Ossie Clark," [profile], available online at The Fashion Page, www.ukfirst.com , 17 July 2001. "Ossie Clark," [profile], available online at Fashion Avenue, www.geocities.com , 17 July 2001. Ossie Clark, described as the King of King's Road, rose to prominence as a fashion designer during the swinging 1960s. Trained at the Manchester College of Art, then at the Royal College of Art, London, he graduated at a time when London was entering a period of international prominence for its designs for the youth market. In a pre-Green era, variety and the ability to produce a fast turnover of styles were desirable qualities in a designer. Clark provided a great variety of images for both daywear and eveningwear. From 1966 Clark was designing for Quorum, a London-based wholesale and boutique business, in partnership with Alice Pollock. His wife, Celia Birtwell, also an RCA graduate, provided many of the pattern designs for the printed textiles used by Clark. He designed both daywear and eveningwear, often using sensuous fabrics such as satin, chiffon, crêpe, and clinging jersey. Although, since he was so versatile and prolific, it is hard to characterize his style, he was probably best known for clinging crêpe and jersey dresses with plunging necklines, figure-hugging waists, and swirling skirts, but he was equally capable of producing close-fitting crisp linen suits. Innovations in terms of cut included suits with elbow-length tight-fitting sleeves over full long-sleeved blouses. In the late 1960s, he used exotic materials such as snakeskin, feathers, and metallic prints. Clark launched his menswear line in 1968, which reflected the period's more relaxed attitude to male dressing. Examples from his first menswear collection included a pink crêpe shirt with a fall of ruffles at the front, diminishing in size and edged in white silk braid. 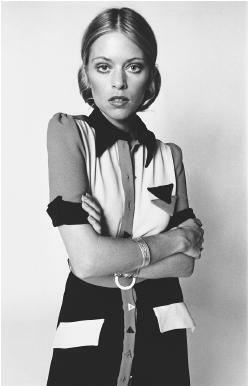 His clothes for Quorum were in the medium-to-expensive price range, comparing with other contemporary designers such as Zandra Rhodes and Jean Muir. Quorum produced garments for direct sale as well as more specialized outfits to order. The company sold through its own retail outlets, through department stores such as the Way In section of the Harrods chain, and through individual boutiques such as Image in Bath. Clark's clothes were sold in America and Europe, being stocked in Italy by Fiorucci. His clientéle in the 1960s and 1970s read like a catalogue of the trendy rich and famous and included Marianne Faithful, Mick and Bianca Jagger, Twiggy, Marie Helvin, Cathy McGowan, and Goldie Hawn. In 1972 Mick Jagger owned no less than 10 Clark jumpsuits. Jagger wore a blue sequined stretch velour jumpsuit that unzipped down the front for his performance at Madison Square Garden in 1972. Clark's clothes were regularly featured in the fashion press, and fashion editors reputedly fought for tickets for his shows in the early 1970s. From 1970, Quorum was two-thirds funded by Rady Fashions and Textiles, which provided the business premises. Alice Pollock dealt with day-to-day practicalities such as organizing staff, buying cloth, and having it dyed. From 1977 Clark had his own company using the design label Ossie Clark Ltd. However, in 1981, Clark's company succumbed to the economic recession, despite having been taken over in 1980 by MAK Industries, which wished to gain control of the Ossie Clark label and attempted unsuccessfully to open an American branch. Ossie Clark Ltd. went into voluntary liquidation in 1981, and Clark was declared bankrupt in 1983. Clark lasted longer than most designers who began in the late 1960s youth boom, which was a tribute to the enduring quality of his design stamina and the range and flexibility of his ideas. Bankruptcy, however, was not the end of Clark's fashion career. He taught at the Royal College of Art and designed evening dresses for Radley Fashions, and in 1986 he launched a lingerie company in partnership with Gina Fratini, trading under the name Rustle. He made use of his skills in employing the bias cut to produce clinging lingerie in silk satin with lace trimmings and insertions. In 1987, Evocative, the newly opened Grosvenor Street boutique, ordered one-off made-to-measure dresses from Clark for individual clients, with ball dresses retailing for £3,000. Despite his still evident international fame, in 1987 Clark was reduced to living by a barter system, such as making a hat for dancer Wayne Sleep, who in exchange paid for Clark's sewing machine to be mended—an enterprising solution all too many young designers may identify with. Clark died in his Notting Hill apartment on 6 August 1996 of stab wounds inflicted by his lover, Diego Cogolato. He left photos and a meager journal of his well-connected life and art, which Lady Henrietta Rous edited in 1999. Reviewer Andrew Lycett dismissed the text as "meanderings." In a less judgemental double review for the New Statesman of a Vivienne Westwood biography and of Clark's diaries, Elizabeth Young summarized: "Ossie Clark's name evokes a familiar pantheon of imagery-prettiness and privilege, spun-sugar rebellion, Mick 'n' Bianca, Twiggy and Bailey, white butterflies, Moroccan lamps, dim rooms swagged and draped with ethnic tassels and fabrics, a fog of incense, rose-coloured spectacles and those early cocksure, thundering chords of the Beatles-Stones-Who soundtrack." After riding out the turmoil from drug problems, bankruptcy, and depression with noticeable grace, Clark received a posthumous renown honoring the chiffon, snakeskin, and op-art funware with which he decked the Beatles, Ali McGraw, Elizabeth Taylor, Faye Dunaway, and Sharon Tate. The town of Warrington, Cheshire, where Clark's family resides, celebrated his talent with a 1999 museum and art gallery showing. Late 20th-century postpunk collectors Sandra Bullock and Nicole Kidman were among those who snapped up Clark's crêpes and gauzes. In February 2000, Decades, a source of vintage chic in Los Angeles, featured a retro honorarium of 100 Clark originals. Shop owner Cameron Silver stated, "I hope to be the one to put Ossie back on the map."